Select from Employers, Employees and Opticians to find answers to frequently asked questions below. Of course if your question can't be answered here, please don't hesitate to contact us directly. Can a voucher be redeemed at multiple Opticians? No. Voucher holders must redeem both the sight test and spectacle entitlements at the same Opticians branch. What does the Safety voucher entitle me to? The voucher entitles you to an eye examination (if approved by your employer) and a pair of safety spectacles. 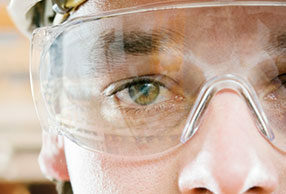 The style of safety frames and lenses will be based on your job role and pre-determined by your employer. What does the Driver voucher entitle me to? 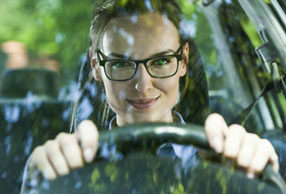 Our Driver vouchers entitle you to a free eye test, and if you require spectacles solely for Driver use, you can get a £25 contribution towards a pair of glasses from the opticians range, or a free pair of single vision spectacles from the SEE Driver frame range. Where can I find the Driver Medical Reports? All SEE driver vouchers come accompanied with two Driver Medical Reports. These reports should be presented to the Optician, along with the eyecare voucher, on arrival for your appointment. The Optician will determine which report is relevant to your job role and the vehicle you drive at work, before completing the report in accordance with your eye examination. Once the Optician has completed the report, this will be returned to you as an employee. You must then return this to your employer. Should you not have access to the reports, please use the links below to download the relevant Driver Medical Report. What determines whether I am entitled to an eye examination or glasses under the DSE regulations? 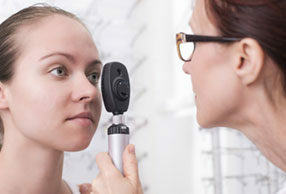 Your employer will assess whether you are entitled to an eye examination, depending on your level of use of VDU or other Display Screen Equipment (DSE). The optometrist will then assess whether corrective equipment is required solely and specifically for DSE use. A summary of the regulations can be found here. Can I see pictures of the VDU frame range? View the Male frame range here. View the Female frame range here. What opticians can I take the voucher to? All SEE vouchers can be used at over 3,000 Opticians across the UK and Ireland. Please click here to view the Opticians Search Page. Generally speaking, SEE vouchers are valid for 12 months. This can vary depending on guidance provided by your employer. Please refer to your employer guidance or alternatively, contact the SEE Helpdesk for further information. What does the VDU voucher entitle me to? Our VDU vouchers entitle you to a free eye test, and if you require VDU spectacles, you can get a £25 contribution towards a pair of glasses from the opticians range, or a free pair of single vision spectacles from the SEE VDU frame range. Please Note: Your organisation/employer may offer an increased discount or alternative lens types. Please refer to your internal staff guidance for more details. All voucher entitlements should also be clearly stated on the voucher. What if my optician isn’t part of your network? If your usual optician isn’t part of our network yet, just let them know about SEE and they can find out all they need to join – free of charge – here on our website. Alternatively, we would be happy to contact them on your behalf to discuss the benefits of joining. Do you have any marketing material I can send to staff? Our helpdesk is open weekdays from 8.30am to 5.30pm. If you cannot find the answer to your query within these FAQ's, please contact us. How can I keep track of who has had their eye examination? You can access a live database through the SEE hub where the details of all of the vouchers that you have issued are automatically recorded giving you complete control of all the vital management information. What is the minimum and maximum purchase? For voucher orders placed online, the minimum order quantity for VDU and Driver vouchers is 5. The minimum order quantity for Safety credits is 15. For any bespoke orders, please contact the SEE Helpdesk. How quickly will I receive my vouchers? Your vouchers will be issued electronically as soon as we have received your cleared payment, so they could be with you within minutes if you are ordering by credit card. Can I use my staff NHS eye test? This is not permitted as occupational tests specifically for the provision of VDU and safety spectacles fall outwith the NHS eye examination. What do I do if my local opticians are not on the network and I want my staff to use the voucher there? How long are the Safety credits valid for? The safety credits have no expiry date. How long are the VDU Vouchers valid for? Generally speaking, SEE vouchers are valid for 12 months. This can be changed to suit specific client needs and requirements. If I lose my voucher can I get another copy? Yes- vouchers can be retrieved by contacting the SEE Helpdesk. What do I do if I don't know my staff’s prescription? If you are unsure, simply select 'full eye test and single vision'. Your staff will get an eye test and the optician will change the voucher if their prescription is not single vision. This change will be replicated by a member of the SEE team on your account. Can I request a Demo to see how the system works? Yes, you can request a demo of the portal via our request a demo page. How do the Safety credits work? 1 credit = £1 and you can build each voucher using the appropriate drop down options to allow you generate a voucher appropriate for each member of staff and their job role. The voucher can be used at over 3,000 opticians across the UK. See our safety page for more information. How do I order more VDU vouchers? You can order more VDU vouchers by logging into your account on our online hub via the vouchers tab, you have the option to pay by card or BACS. How do I order more safety credits? You can order more Safety credits through our online hub via the vouchers tab, this gives you the option to pay by card or BACS. All SEE vouchers come accompanied with two Driver Medical Reports. The patient should present these reports to you as the Optician, along with the eyecare voucher, on arrival for their appointment. The relevant report should be determined and completed by the Optician, in accordance with the eye examination. Once the report is complete, this should be returned to the employee/patient. Should the patient fail to provide the relevant Driver Medical Report, these can be located and downloaded below. How do we process the voucher to get paid? Once you have completed the voucher, inclusive of your practice details, it must be sent to SEE by email (vouchers@smartemployee-eyecare.com), fax (01224 212700) or post (14 Crown Terrace, Aberdeen, AB11 6HE). Once received, SEE will process the voucher to ensure you are reimbursed our Opticians fee. What are the patients entitled to with the VDU £25 voucher? With the voucher, patients are entitled to a free eye test and, if the patient requires VDU spectacles, £25 towards a pair of glasses from the opticians range, or a pair of the free spectacles. Please check the voucher carefully for other client offers. Can we accept the voucher if we are not on the list? Yes if you are willing to accept the voucher it is no problem, you can join our network for free by registering as an optician on our hub. Are we on your list of opticians? You can check by visiting our opticians search and searching for your business name or postcode. If you are not on the list and would like to join, register here. What do we get for processing the voucher? You get £10 and the benefit of the upgrade should a patient not select free glasses from the included ranges. Where can I find the relevant spectacles order form? Can I see pictures of the free frames? Yes, please use the following links to view our Safety, Driver and VDU frames. View the free Male VDU range here. View the free Female VDU range here. View the Safety range here. View the Driver range here.